Manufacturers in industry segments across the board are being challenged to improve the efficiency and performance of their products. Rising emission standards and other manufacturing requirements are driving the need to improve the quality and efficient operation of every component. The effects of component stress as a result of the manufacturing process are also a concern for components that will be functioning under extreme operating conditions. 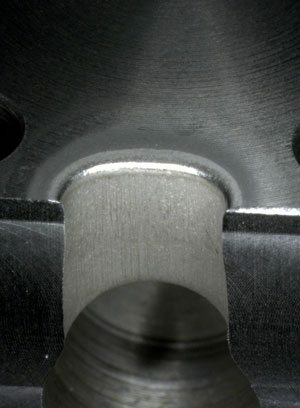 Electrochemical machining is a method that finishes the workpiece surfaces by means of anodic metal dissolution. 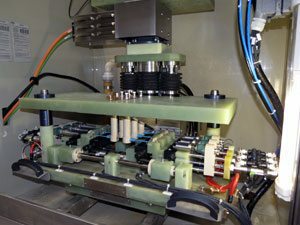 The fixture including the tool (cathode) (-) acts under DC current and in the presence of an electrolyte fluid to create the anodic reaction that removes workpiece (+) surface material in a precise manner. Dynamic ECM is a modified ECM process in which the cathode moves with constant speed into the part, providing finishing results for components with complex shapes that are difficult if not impossible to achieve with conventional machining methods. Dynamic ECM consists of a drive axis and customized (part-specific) tooling. The tool (cathode) is connected to the drive unit (axis) located on the upper part of the tooling. Parameter input is controlled through the Operator interface, and is stored under a part-specific file for repeatability. The drive unit moves the cathode with constant, controlled speed into the part. Process control (parameter and short circuit control) ensures dimensional accuracy. Our Dynamic ECM Tooling Provides the Edge. The tool (cathode) is a critical element of the Dynamic ECM process because its properties and shape determine where and how much material is removed from the workpiece. The tool material provides the electrical resistance that maintains the constant gap between the cathode and workpiece surface. Because the cathode never comes into contact with the workpiece, the tooling has no process-related wear. Radiusing: Creates a defined edge rounding. Specialized application capabilities. Suitable for shaping and drilling of components that are difficult to machine using other methods. Ideal for components with trumpet, elliptical or other intricate shapes and tapered or deeper holes. Longer component life. Dynamic ECM does not create mechanical loads or thermal loads on the part. This eliminates the challenges of surface oxidation, mechanical stresses, and micro-fissures caused by heat transfer. Longer tool life. Material properties (such as hardness) do not affect the feed rate or tool consumption, making Dynamic ECM a cost-effective choice for tougher materials. No deburring requirements. As a dissolution based process, no burrs are generated. Increased productivity. The process time for the Dynamic ECM process is fast as compared to conventional methods (feed rate up to 7mm/min). Additionally, multiple parts per axis as well as multiple holes per axis can be machined resulting in a lower unit cost of production.